Reinsurance is financial market trading in the risk of unpredictable and devastating disasters—e.g. Hurricane Katrina or the Tōhoku earthquake and tsunami—that are increasing in frequency, severity, and cost. Reinsurance insures insurance companies, enabling them to pay claims arising from their losses; a market mechanism that provide a critical social and economic safety net. To demonstrate how risk is calculated and traded globally, this book uses real-life tales from an ethnographic, “fly-on-the-wall” study of the global reinsurance industry over three annual cycles. Underwriters were shadowed around the world as they traded risks through multiple disasters. Readers witness the desperate hours of pricing Japanese risks during March 2011, while the devastating aftermath of the Tōhoku earthquake is unfolding. There are authentic observations of reinsurers in Bermuda, London, Continental Europe, and South East Asia as they evaluate, price and compete for different risks during their everyday practice. Understanding how this market for disasters works has never been more critical, given the impact of climate change and increased global connectivity, where a flood in one country can trigger losses to supply chains around the world. The book develops a novel concept of how global markets work, advancing scholarship and challenging current thinking about how financial markets trade in intangible assets such as risk. As consolidation has taken hold, this has cut sharply the number of players who handle reinsurance products — meaning that the sector now looks less like a diversified “market” than a club. And while the insurance companies say they want to “diversify” their risks, they are all doing this in exactly the same way — which produces less, not more, diversity. 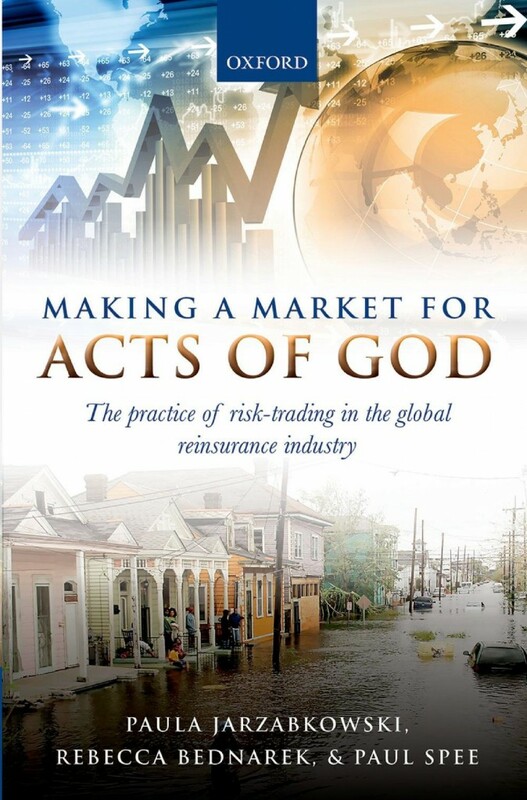 In this Insurance Institute of London lecture (April 2015), Professor Paula Jarzabkowski launched her book “Making a Market for Acts of God: The Practice of Risk-Trading in the Global Reinsurance Industry” which explains the practice of risk training in the global reinsurance industry today.